When Shaista Khan failed to kill Shivaji, Aurangzeb was restless and sent another one of his generals named Mirza Raja Jai Singh. Raja Jai Singh was a Hindu general who was the scion of the Suryavanshi Kachhawa. On Aurangzeb’s orders, he along with his general Diler Khan laid siege to Purandar while also causing a systematic loot and destruction of Maharashtra. At that time, Murar Baji was the Maratha commandant at Purandar. Diler Khan launched vigorous attack on the Fort of Purandar in order to break the spirit of the Maratha troops and hence he successfully forced his way through the outer defences of Purandar. However the Maratha forces were not intimidated easily. They piled their defences to the inner fort while simultaneously continuing their attacks on the Mughals. One fine day, the fort commander Murar Baji decided to go out with full force and hence attacked the Mughal forces which had captured the outer fort. The Mughal forces were taken aback by surprise attack as they were not expecting an attack of this magnitude and hence they broke ranks and rant to their camp where Diler Khan was . This Fearless attack cost the Purandar commandant his life and hence he passed away. With the death of Murar Baji and the dragged on Siege, forced Shivaji to arrange a compromise with Raja Jai Singh in order to protect the population of Maharashtra and end their suffering. This Treaty was signed between Mirza Jai Singh and Shivaji Maharaj. Among many other aspects and conditions of this treaty, one which was most significant was that Shivaji was to accompany Mirza to Agra where he would be presented before Aurangzeb. Therefore Shivaji decided to go to Agra in the year 1666. When Shivaji arrived at Agra, he was presented to the court of Aurangzeb where he was humiliated when Aurangzeb deliberately made him stand behind a lesser noble person, who was defeated by Shivaji in battle. Aurangzeb had pre-arranged this scenario. Consequently Shivaji left the court furious which gave Aurangzeb the excuse he was looking for to declare Shivaji of having committed the crime of contempt in the Mughal court. Shivaji was detained in Mirza Raja Jai Singh’s house where Shivaji was originally staying. 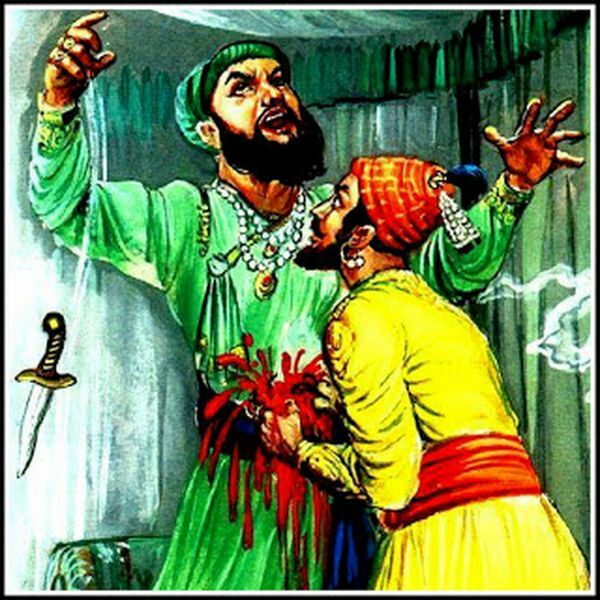 Shivaji sensed that something was going on in Aurangzeb’s mind and he wanted to kill Shivaji and he was right because Aurangzeb had made plans to move Shivaji to the Mughal Dungeons. Shivaji escaped the Mughal prison in a spectacular manner by hiding in large baskets which were meant to hold fruits and sweetmeats. These baskets were used to send food to Brahmins and holy men every day from the prison. Shivaji’s general, Netaji Palkar was also captured by the Mughals and was forced to convert to Islam and even change his name to Quli Mohammed Khan. He was forced to serve as a Mughal soldier in the Afghanistan region until he also escaped and re-joined with Shivaji. He converted to Hinduism and joined the cause of Swaraj once again. After his brave escape from the Mughal clutches, he returned to Deccan where he again raised an army and recaptured all the forts which the Mughals had made him surrender according to the Treaty of Purandar. Tanaji Malusare, was one of his brave generals and during this phase of Shivaji's might, he wreaked heaven on Mughal forces. But while recapturing the indispensable Fort of Kondana from Uday Bhan, who was a betrayer Rajput and also the Mughal commander of the Fort, he lost his life. Once Shivaji had recaptured all his forts, he was convinced by the Banaras Brahmin Gaga Bhatt and his mother Jijabai to formally announce himself as the king of the Marathas. The coronation ceremony took place at Raigad on the 6th of June 1674 which was attended by the representatives of the British and other foreign powers. Shivaji launched several campaigns in Karnataka and Tamil Nadu. He expanded his influence to Thanjavur in Tamilnadu. From 1674 to 1680, it was a peaceful period for the Marathas because the Mughals had taken a step back and did not make any more attempts to disturb the might of the Marathas. In the year 1680, when Shivaji finally died, Aurangzeb once again dared to invade Maharashtra. Even then he was aware of the mighty Maratha forces and hence did not assign this task to any of his generals. He himself came to Maratha in the year 1682 and stayed on in the Deccan region until he died in the year 1707. After Shivaji's death, the Marathas fell into disarray. His successor was his eldest son Sambhaji who proved inadequate to the responsibilities of the Maratha Kingdom. He was unable to keep up the flame of Independence which was started by his father. Although Sambhaji was extremely brave and fearless but he was very often defeated by his own vices. He was very short tempered and indulged in activities like wine and women. All the incredible things that Shivaji Maharaj had done in his life, it seems that he did not have enough time to groom his successor. When Shivaji was king, his son Sambhaji quarrelled with him and left the kingdom to join with the Mughal forces to become one of their Mansabdars. But he realised his mistakes and came back to his father to repent. Shivaji forgave him but was extremely hurt as the chimerical nature of Sambhaji had been exposed to him. When Sambhaji was crowned as Chhatrapati, he blindly followed policies which later on proved to be detrimental to the Maratha power. He often took advice which was nothing but short sighted, from his friend Kavi Kailash. In the end, he was captured by Aurangzeb and due to his outspoken nature, Aurangzeb sentenced him to death by torture. His eyes were gouged, his tongue cut off clean along with his arms and legs. Sambhaji suffered a very cruel death but till his last moment never released his faith to the Mughals who were trying to make him convert to Islam. you need to refer history again because your knowledge sambhaji raje is so poor.